A NORTH Yorkshire father and son team has scooped a major national award for its work on the restoration of an historic building in the county. Harrogate-based Chris Green Painters and Decorators was given the task of redecorating a 17th Century farmhouse in Knaresborough in just six weeks. 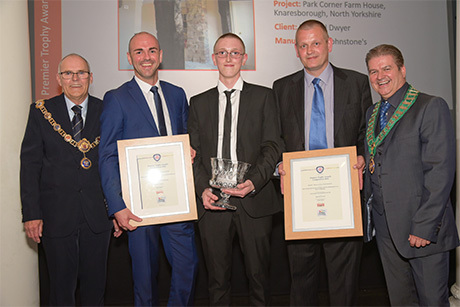 Now the company, owned by Chris Green, who works with his son Matt, has landed the Small Contractor Project of the Year in the Premier Trophy Awards – a national competition promoting high standards of craftsmanship organised by national trade body the Painting and Decorating Association. The company, which was established in 1987, fought off stiff competition to secure the prestigious title, presented at the 28th annual Premier Trophy Awards at Northumberland Avenue in London. The result was a proud moment for Chris and Matt, who received their accolade in front of hundreds of representatives at the event. Chris said: “We are absolutely delighted to receive this award. “The news is still just sinking in." The project involved the complete redecoration of the property - originally built in the 1600s - to an extremely high standard using Johnstone’s paints. Works included the treatment of distressed/deteriorated oak beams and the repair of plasterwork on ceilings and walls. Neil Ogilvie, Chief Executive of the Painting and Decorating Association, said: “The judging panel felt that the work was completed to a very high standard indeed and in keeping with the original décor of the farmhouse. “Both new and old surfaces have an excellent finish throughout and the client was delighted with the workmanship of the entire project."